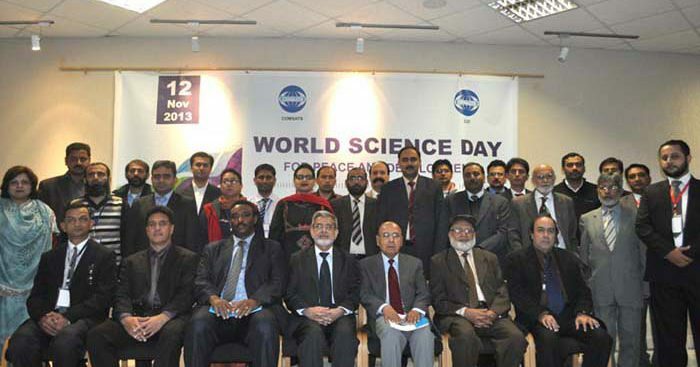 The World Science Day for Peace and Development 2013 was commemorated by COMSATS by holding a seminar on ‘Science for Water Cooperation: Sharing Data, Knowledge and Innovations’ in Islamabad, on November 12, 2013. 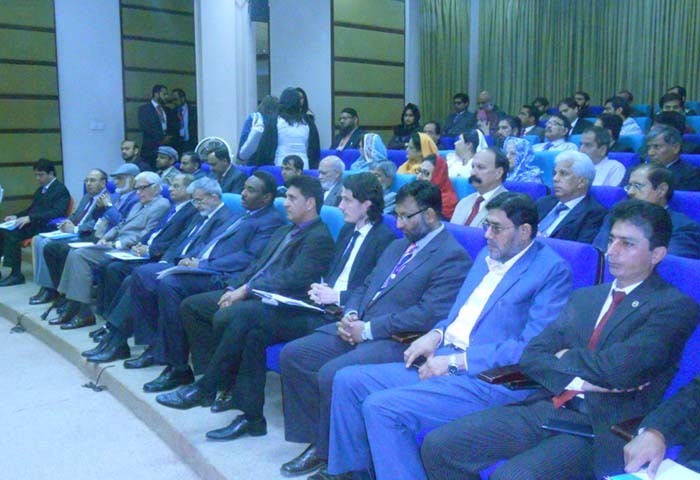 The event was held at COMSATS Institute of Information Technology (CIIT), Islamabad, and was attended by more than 70 students, academicians, scientists, and diplomats. 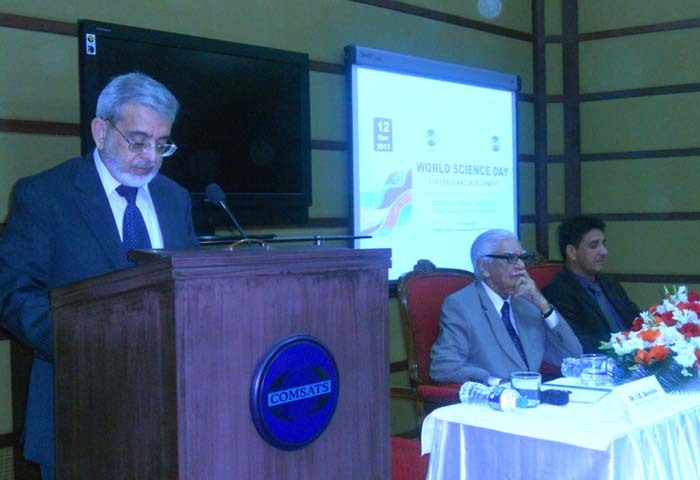 The event commenced with a brief inaugural session presided over by veteran scientist and former Advisor to the Prime Minister of Pakistan on S&T, Dr. Ishfaq Ahmad. The session comprised a Welcome Note from Dr. Shahid Ahmed Khan, Campus Director, CIIT, Islamabad; an Address by the Executive Director COMSATS, Dr. Imtinan Elahi Qureshi; and a Keynote address by the Chief Guest. Dr. Khan welcomed the distinguished guests and participants of the seminar and stressed the need for capacity-building events in sensitizing societies and proffering research-based solutions for development issues. 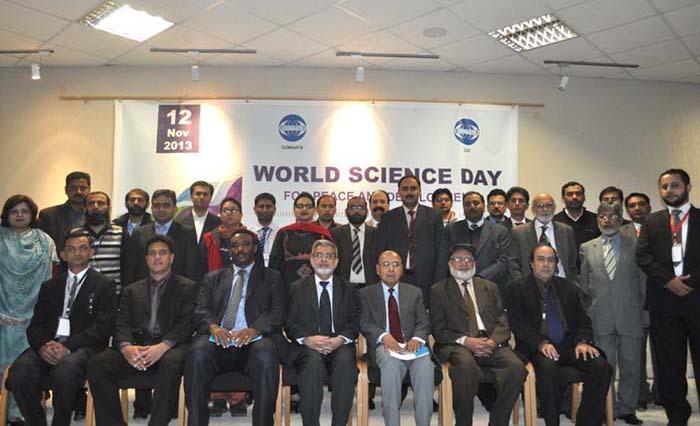 In his address on the occasion, Dr. Qureshi noted that Pakistan has the distinction of being the country on whose request the United Nations decided to celebrate World Science Day every year on 10th November. Dr. Qureshi also informed that 10th November coincidently is the birthday of a renowned Pakistani scientist, Prof. Dr. Riazuddin, who had sadly passed away on 9th September 2013. Stressing the importance of the title of the Day, Dr. Qureshi gave a broader perspective whereby science has been used both for the betterment of mankind, as well as for the purpose of war and destruction. Only the ‘lights’ of science need to be celebrated, he opined, while ‘shadows’ are to be shunned and discouraged. Dr. Qureshi also elaborated worldwide focus on freshwater availability and cautioned that Pakistan will face a major destabilizing situation if water management were not addressed at the highest priority. Speaking on the occasion, Dr. Ahmad stressed the need to keep water-relate d issues on high priority by international organizations like IIASA, UN, and COMSATS. He recalled that an extensive discussion session on water issues was organized by COMSATS in 2001 and the proceedings were published in a book form in 2013. The technical session of the Science Day comprised four talks pertaining to the theme of the Day. Dr. Qamar-uz-Zaman Chaudhry, Senior Advisor, LEAD Pakistan, in his keynote speech, explicated the concept of water cooperation and highlighted its importance in the wake of Pakistan’s diminishing water resources to a critical level of 1000 m3 per person per year. He cautioned that serious steps must be taken in time to address the depleting water resources of Pakistan, which is highly vulnerable to climate change effects, lest the country face even graver issues of water, food and energy security. Other speakers of the seminar were: Dr. Amir Haider Malik, Professor, CIIT Abbottabad Campus; Dr. Zulfiqar Ahmad, Professor, Department of Earth Sciences, Quaid-e-Azam University; and Dr. Hassan Abbas, CIIT, Wah Campus. The speakers advocated efficient use of technology-based solutions in the field of water resource management to enhance per capita water availability in the country. A new concept of sub-irrigation was introduced that could enable Pakistan to save water at least 4 folds, increase agriculture yields by 64% and improve water-use efficiency by 6 folds.Consensus prevailed among the experts to make increased efforts to promote ‘water cooperation’ among nations to ensure poverty reduction, socio-economic development, protection of environment, and promotion of peace and sustainability.